What’s so great about Feed.Us? There are some amazing Content Management Systems (CMS) out there, huh? They can store content, sure, but they’ll also handle your Search Engine Optimization (SEO); manage your site template; run your versioning, check-in, and QA processes; balance your checkbook, and give you a foot rub. The problem comes when you want to change or upgrade or add to any part of that equation. If your Uber-CMS can’t do it, you have to choose between the pain of workarounds and the cost of upgrading the whole darn thing. And you know how that usually goes. We’ve created a completely different kind of CMS, a simpler and better way to handle site content. Feed.us doesn’t want to take over your entire site... and it certainly doesn’t want to rub your feet. Feed.Us just wants to handle your content and play nicely with others. Whatever components you have running now, whatever you need to upgrade or change in the future, Feed.Us will fit right in. What can I do with Feed.Us? One way to use Feed.Us is to create a document with the Feed.Us editor, then publish each item separately. That makes sense if you’re updating just a few items once in a while. But some of our customers rarely visit Feed.Us once it's installed; they’d rather use other writing tools, and we’re good with that. So good, in fact, that you may forget you’re using Feed.Us... except for the part where you’re not messing with ftp transfers or rebuilding your entire site every day. Some Feed.Us customers publish via Feed.Us using email or Google Docs, an RSS feed from another site, or their own blog with Metaweblog API support. Some use Flickr for images and YouTube's "favorites" to post videos. They even use Delicious to update links. Or use other blog systems with MetaWeblogAPI. All of that content can be easily imported into Feed.Us. And we can work with customers to build custom imports from other sites and systems using XML. When you purchase a CMS software program it comes in a box, you install it on your machine, dump all your content into it, and it runs your life from there. 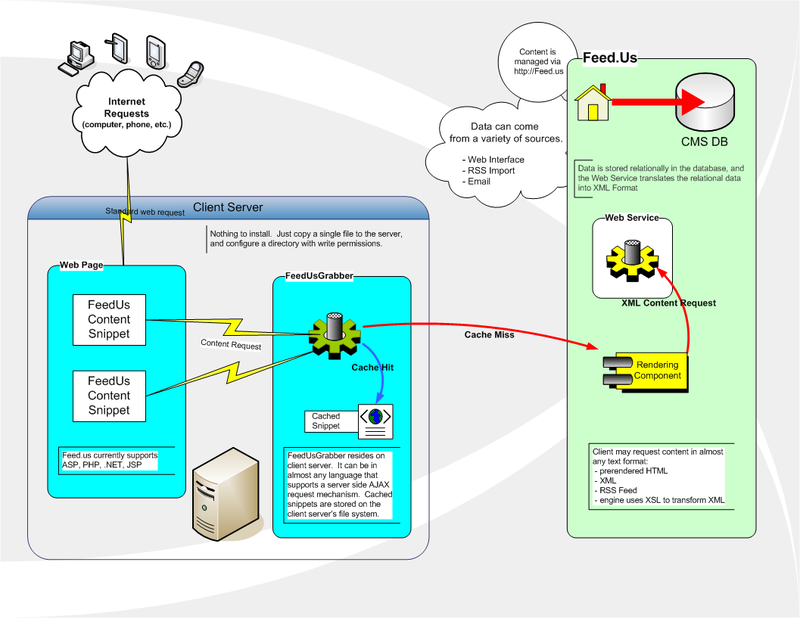 Feed.us is not software, it’s an online service. It doesn’t come in a box, there’s no big installation to contend with, we store your content and we run your backups. Feed.Us completely ignores whatever else you have running and builds a dedicated line between a chunk of content on our server and the exact spot on your site where that content should show up. Create one directory and one folder. 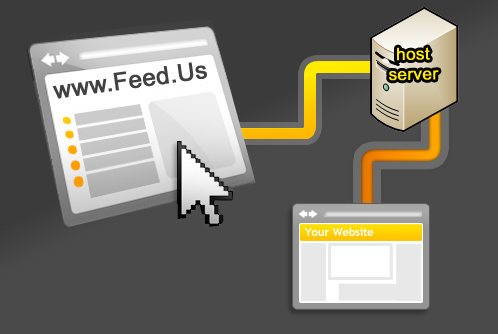 Feed.Us needs its own directory on your hosting server; in that directory it needs one folder named WebCacheDirectory where Feed.Us stores the latest version of your site content. That way, your content will pop right up when a user asks for it, and you look like a superstar. Download one or possibly two Feed.Us files. Copy and paste a few lines of custom code (we generate this for you). Once you have your new content in your WebCacheDirectory, your site needs to know where to put it. You plonk this code right into your page, exactly where you want that chunk of content to show up. What could be simpler? So go ahead and get started: your first step is to create some content.